It was 2016, and Hublot the Swiss watch manufacturer had just released the MP-05 LaFerrari Sapphire. To excite clients, a movie telling the story of how the watch came to be was created by Digital Domain, and Hublot had asked Ferrari Beverly Hills to help them debut this film to the world. The catch? 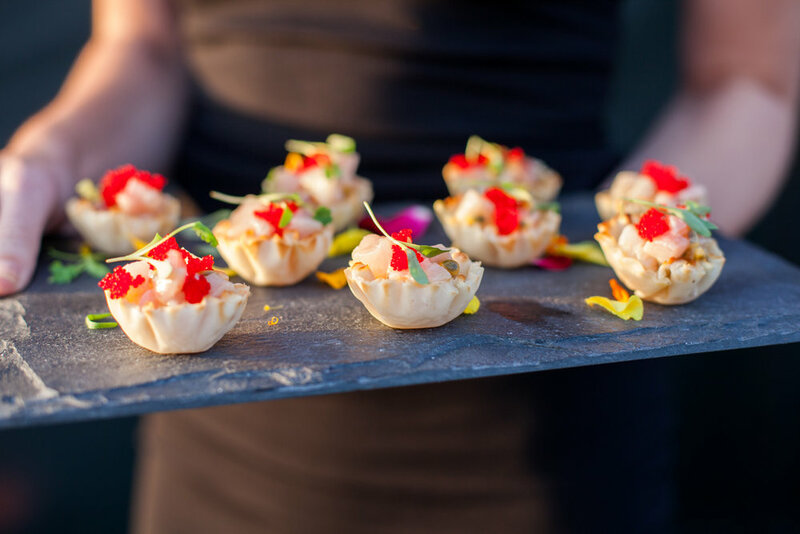 The event idea was conceived just four weeks shy of the annual Monterey Car Week, and Silvestri was called to the table for both. With the annual event near completion, Silvestri then shifted her focus to Hublot to create an experience unlike any other. When first introduced to the Hublot team, they had seemed to know exactly what they wanted in the event. Silvestri was given three criteria that were a must; there was to be a driving component, an outdoor venue, and the Hollywood sign must be visible. Quite a task to be completed in Beverly Hills all while creating the overall experience of a drive-in. But after searching high and low, Silvestri got creative with a construction site. The former Ace Museum on La Brea was at one time a dealership. This element of the venue gave Silvestri the confidence that a drive-in was possible. Upon making her way to the top deck, she was welcomed to the sight of the Hollywood sign, as well as a few unexpected obstacles. Due to construction, the actual structure was not as drivable as it once was creating a difficult pathway to the rooftop for vehicles, and just days before the event elevator access had malfunctioned and there was no longer access to bathroom facilities. No challenge too big to overcome, Silvestri had used vehicles from Ferrari Beverly Hills inventory to stage the drive-in and create a unique seat to view the film, and luxury event restrooms were rented for the night. But it wasn’t easy to place 16 cars on a rooftop with a narrow entryway, not to mention the active construction site. Set-up took 3 days, all of which consisted of high winds. All challenges conquered and aside, the night had finally arrived, and guests were able to see the traditional movie going experience through the eyes of Silvestri. Being an automotive event at heart, guests were welcomed by models from Runway Waiters and a unique Ferrari race car sponsored by Hublot, and while their vehicles were valeted away, they were taken on a 3 story interactive preview into the short film they had come to see. The pathway was lined with glowing white spheres much like the tunnel in which the La Ferrari first enters. From there, a lunar effect took over, and guests drove through pillars of light and smoke, with the sounds and magnified imagery of the inside of a watch ticking away, all created by WOVA. Built to resemble the film, though every time the car passed through pillars of light it had symbolized the watch being charged. The second floor glowing blue, was filled with Hublot branding and music echoed, while on the final floor guests made their way through the final charge, and past a six ft. tall sculpture of Hublot in metal lettering; much like the Hollywood sign! From there they were dropped off at a step and repeat for their photo and until their photo was taken no element of the event was visible. As soon as they walked in, they had entered a truly transformed construction site. Guests were then offered champagne from strategic partner, Veuve Clicquot, or were welcomed to stop by the bar for The Grand Bevy’s signature molecular cocktail complimented by flakes of silver. 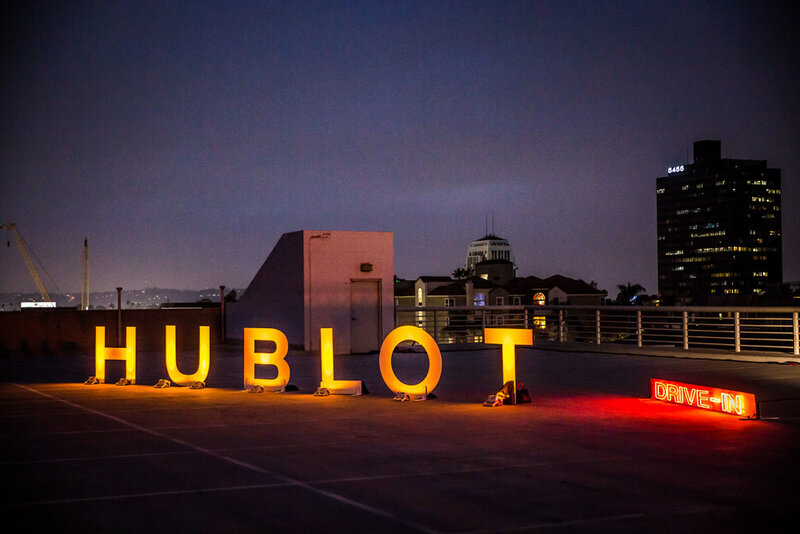 The rooftop was filled with guests including the Hublot team with Ricardo Guadalupe among them, not to mention sixteen Ferrari’s; all pointing towards the full-sized theater screen, with the Hollywood just behind. For the Swiss watch manufacturer, Silvestri had epitomized the movie town of Hollywood, as well as instilled the luxury feeling of Beverly Hills, Ferrari, and Hublot; an exaggerated movie going experience, imagined by Letizia Silvestri. To view the film that had inspired the night, visit HERE. Photo courtesy of Hublot and Ferrari Beverly Hills. Photography by Stephanie Godfrey, Alena Graff, Ted7, Matt Beard. Videography by Advent Films.